We offer the only loyalty program that rewards you based on how much, and how many days you wager, each year. We host tournaments almost every week, all year round. Compete against the experts and other Xpressbet members for cash prizes — and bragging rights. Don’t pay to play! Xpressbet gives you free access to Past Performances so that you can make better, more informed choices. We're here to help you win. Our experienced handicappers provide free picks at multiple tracks every day. Account holders never miss a moment of the action. We offer live, HD video and an extensive library of race replays. 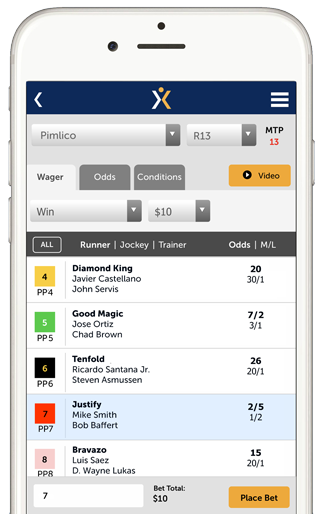 Place bets on the go or at the track. Deposit in any of 9 ways, and use your funds to instantly place a bet on one of our 300+ tracks. Promotional offer valid through 12/31/2019. Open to new Xpressbet account sign-ups and inactive DRF Bets members only. $10 Free Bet will be deposited into new accounts within one hour of successful sign up. No wager or deposit required. Customer has 30 days to use the $10 credit after it is deposited into their account. Any unused credit will be withdrawn 30 days after it was deposited. Wagering credits are different from cash, and cannot be transferred, redeemed or withdrawn. Customer has 30 days to use wagering credits. Unused wagering credits will be retracted after 30 days. Must be 18 or older (21 in AL, AZ, IA, IN, KS, NH, ND, WA) to open an account with Xpressbet, LLC and reside in a state where such activity is legal. Void where prohibited. Cannot be combined with any other offer. National Gambling Support Line 800.522.4700. Active DRF Bets customers are ineligible to earn this offer. An active DRF Bets customer is defined as someone who has placed a wager with DRF Bets in the last 13 months.